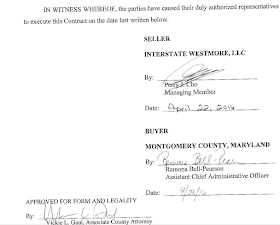 A picture is worth a thousand words - and here are pictures of the contract Montgomery County quietly signed to purchase 1000 Westmore Avenue for use as a school bus parking facility. 10 acres of undeveloped land in an industrial wasteland cost you, the taxpayer, $12 million at the same time that the County Council was raising your taxes to the highest level in history, and County employees were denied the wage increases guaranteed by their labor contracts. 1. 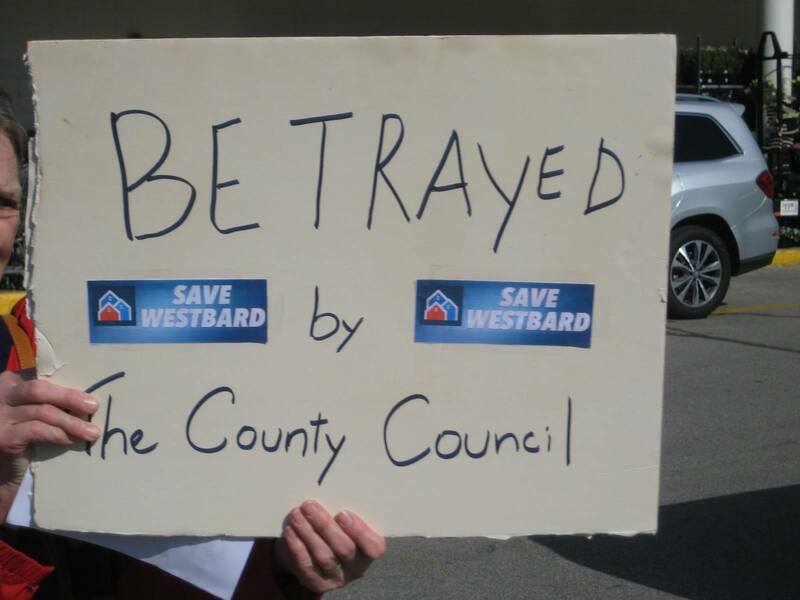 Will the County Council apologize to the affected communities, and admit that their votes brought us to this point? Councilmembers, like hack actors ill-prepared for the role of a lifetime, attempted to pose as heroes-to-the rescue once the Carver Coalition was formed to fight a bus depot proposed for the Carver Educational Services Center in Rockville. 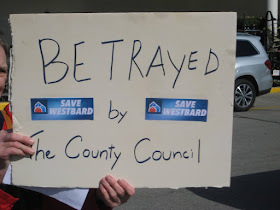 Problem is, the County Council are the very people who voted to approve funding for the land acquisition, design and construction of bus depots at Carver and Westmore. That's right. 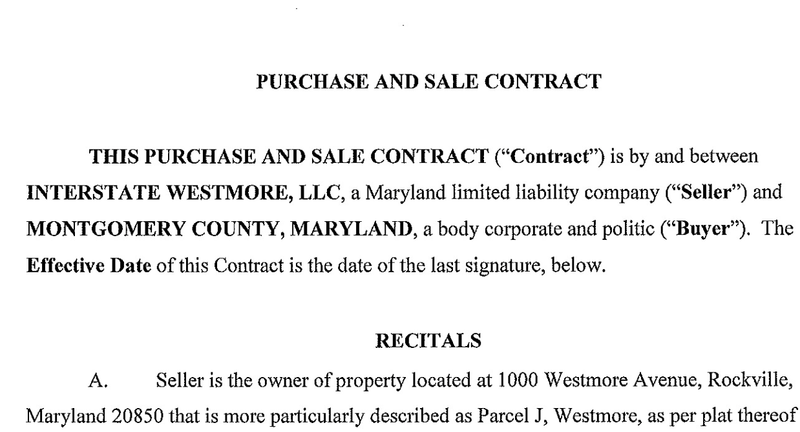 The contract you see here was the direct result of a 2015 vote by the County Council, which provided the funds the County Department of General Services used to purchase the Westmore site. Whoops! 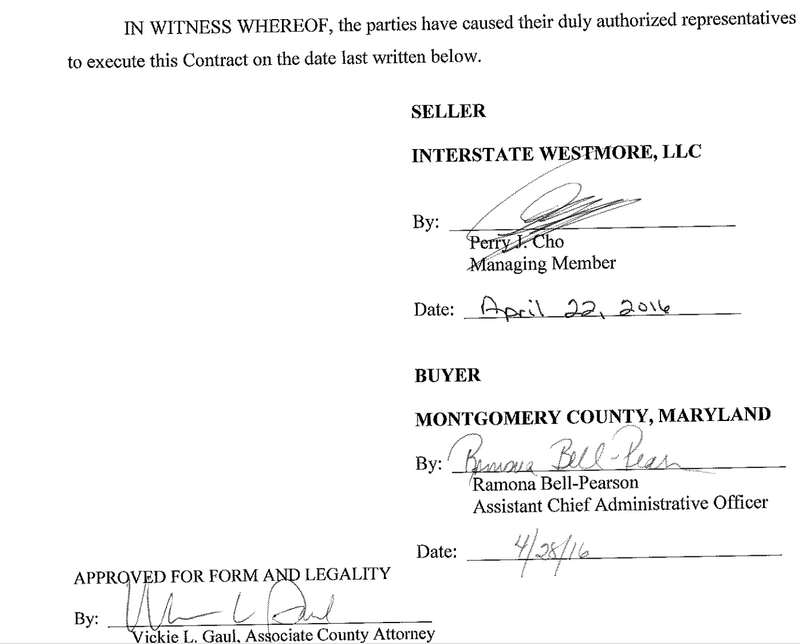 Likewise, a February 9, 2016 resolution passed unanimously by the County Council provided funds for the design and construction of a bus depot at Carver. Councilmember George Leventhal conveniently forgot about that vote when he appeared as a crusader for justice at a Carver-related public meeting. He proclaimed to have nothing to do with the Carver fiasco. When a citizen confronted him with the text of the February 9 resolution, and asked him to read it aloud, Leventhal refused to do so. Leventhal later stated he had not read the resolution before voting for it, an incredible statement any way you slice it. Our councilmembers don't read the bills and resolutions they vote for?! Unreal. The Council didn't admit their role then, and they haven't since. Tomorrow is a fabulous opportunity for them to belatedly admit that they alone had the true power to create this fiasco via these two votes, and their longtime support for the insane idea known as the "Smart Growth Initiative." Don't just bash DGS for an hour, own up to your major role in this mess. 2. Will Tuesday just be a back-and-forth between DGS, MCPS and the Council, which loves to hear itself talk? Or will the civic association leaders and municipal elected officials of Rockville and Gaithersburg have a seat at the table, as well? 3. Will the Council end the discussion by pulling the plug on the Smart Growth Initiative, by committing to not signing the Declaration of No Further Need for the existing bus depot on Crabbs Branch Way, thereby risking legal action by the developer? What the Council hasn't admitted so far, but has a chance to acknowledge tomorrow, is that there is no acceptable site to relocate 410 school buses to within the borders of Montgomery County. Period. The County has reviewed 200 properties in the desperate search for a depot. Choosing two adjacent to residential neighborhoods at Carver and Westmore proves the point that there is no dream site - otherwise, they wouldn't have risked the political uproar they now face. Every single site discussed and dismissed in the past was in a residential area, from Potomac to the Webb Tract in Montgomery Village. Every community fought back, and they'll fight back on the Gude landfill (Derwood homes are directly adjacent) and Public Safety Academy (North Potomac homes are across the street) sites if DGS goes there next. Only by pulling the plug will the County be unable to use the Westmore site for school bus parking. Of course, then the County (a.k.a. you, the taxpayer) will face legal action from the developer, and the costs and payouts that might entail. There again, the Council must be held accountable for its reckless actions in the Smart Growth/bus depot debacle. There must be consequences for their actions. Tuesday is not a day for the Council to toast themselves as heroes, but a day to begin to face the music for their disregard for their constituents, and for prioritizing developers over people in Montgomery County.